Cosmic horror is one of the most obscure yet powerful subgenres in the world of speculative fiction — indeed, the mere implications of the word “cosmic” are enough to make you shiver. And true to its name, cosmic horror is all about the vast unknown. Its terror derives from the mysteries of the universe, and what could be lying in the shadows. As you may know, H.P. Lovecraft is widely credited as the originator of cosmic horror — it certainly wouldn’t be the same without his contributions, and is often called “Lovecraftian horror” after him. However, the two are not exactly synonymous; though Lovecraft largely pioneered the ideas of cosmic horror, some early examples of the subgenre precede him, and successors have developed it in countless new and fascinating ways. This post will largely focus on titles other than those written by Lovecraft — not least because we already covered 10 of his must-read works in another post! What we're offering here is a little more variety: a wide-ranging list of 15 chilling cosmic horror titles to get you started. The House on the Borderland, published in 1908, is one of the earliest identifiable works of cosmic horror — Lovecraft would later cite it as inspiration for his own work. The novel employs a frame narrative in which two fisherman discover the diary of a man called “the Recluse,” who once lived in the titular “house on the borderland.” The journal is a record of the Recluse's life, which grows increasingly disturbing as we read on. 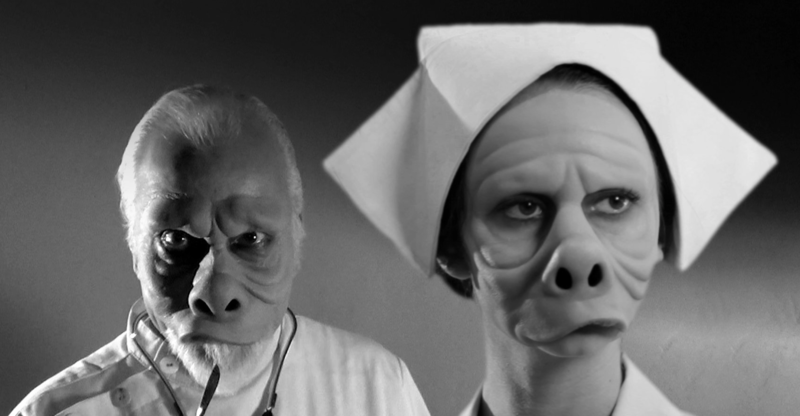 At first, the Recluse merely suffers from strange visions, but soon he is attacked by one of his supposed hallucinations: a horrific humanoid with pig-like features (Twilight Zone, anyone?). As the Recluse battles the onslaught of the “swine-things,” he realizes that they come from a world very unlike his own — and that he’s being pulled into it himself. From there, the novel becomes a surreal account of the Recluse’s experiences in that dimension… though based on how it’s presented, we can’t be sure how much of his story is true. But one thing is for sure: this novel is a remarkable feat of early cosmicism that remains terrifying to this day. This collection comes from the twisted minds of many iconic horror and sci-fi writers — including Lovecraft, with his short story “The Colour Out of Space.” However, what’s really interesting is to see other authors, most known for their own particular brand of horror, write with a slightly more “cosmic” inclination. For instance, Bram Stoker’s story “The Squaw” turns to enigmatic rather than folkloric frights: it implies that the spirit of a grieving woman has followed her enemy to another country, where she intends to enact revenge in a non-human form. And Edgar Allan Poe’s story, “MS. Found in a Bottle,” takes his talent for the uncanny and brings it out to sea — a vast, unknowable expanse where our narrator finds himself unable to save a ship from Antarctic doom (a strikingly similar scenario to Lovecraft’s At the Mountains of Madness). In any case, no matter how you feel about each of these authors individually (though hopefully you’re already a fan — especially if you’ve read our list of the 100 best horror books of all time! ), this anthology is an unmissable read for any burgeoning cosmic horror lover. Okay, this collection is admittedly 100% Lovecraft — but we’ve included it because so many contemporary cosmic horror works build upon the mythos of Cthulhu. In that sense, reading The Call of Cthulhu is a prerequisite for the course: it’ll provide context to help you understand the forthcoming material. The Call of Cthulhu follows our narrator, Francis Wayland Thurston, as he unearths alarming information about the figure of Cthulhu: a titanic monster with tentacles and the wings of a dragon. Thurston realizes that many people are connected subconsciously by the “call of Cthulhu,” which the creature emits from his resting place below the ocean. There’s even a cult devoted to Cthulhu, who chant of his inevitable return. As you can probably tell, Cthulhu is one of Lovecraft’s most compelling creations, both in and out of canon — so this story is definitely worth a read (as long as you don’t find yourself sympathizing with the cultists). Ligotti’s 1986 short story collection contains three sections, each named for different types of dreams: Dreams for Sleepwalkers, Dreams for Insomniacs, and (most chillingly) Dreams for the Dead. As you might expect, the cosmic creepiness escalates as the anthology progresses. However, the subgenre’s influence on Ligotti is clearly evident from the very first story, “The Frolic,” which involves a serial killer corrupted by an unknown supernatural force. Songs of a Dead Dreamer culminates in a story called “Vasterian,” which eerily mirrors many elements of “The Frolic,” but is told from a much more unstable perspective. Needless to say, despite the title, you probably don’t want to pick this one up before bed. Though “The Imago Sequence” is only one of Barron’s many excellent stories, we’re going to home in on it as an exemplary work from his repertoire. It begins with a cocktail party, described in the author’s signature vivacity, during which our narrator Marvin comes into contact with a valuable photograph that’s part of the three-piece “Imago Sequence.” He’s told that the final photo, entitled “Imago,” remains a mystery to the general public: not only are its whereabouts unknown, but it’s never been displayed publicly. Barron’s poetic style lends a resonantly eerie sense to this already perfectly plotted horror story, gradually amping up the suspense until you almost can’t take in anymore. But when the climax of "The Imago Sequence" arrives, you’ll almost certainly find yourself unprepared for its impact. You might not think of this one as cosmic horror, probably because it’s been characterized as “modern Gothic” in the literary world — more Shirley Jackson that H.P. Lovecraft. However, Oyeyemi is an author of many talents, and cosmicism would seem to be one of them. White Is For Witching masterfully relates the tale of the Dover-dwelling (classic foreshadowing) Silver family, which has just lost their matriarch, Lily. Her daughter Miranda is afflicted with pica, which compels her to eat chalk like candy, and Lily’s death only worsens the condition — causing Miranda to become even more disconnected from reality. When she starts communicating with spirits, there’s simply no turning back: Miranda is lost to a world unknown. But this is only the beginning of the story, which Oyeyemi renders with a mystical air reminiscent of actual legend. Her haunting, lyrical style is unlike any other — you wouldn’t be wrong to say that Oyeyemi herself is a witch of words. Cthulhu’s Reign is a particularly innovative collection of Lovecraft-inspired stories, all taking place in a universe wherein the revival of the “Great Old Ones” is not merely prophesied, but has already come to pass. The characters in these stories must contend with a new world, ruled by unimaginably powerful creatures, and try to protect themselves even as they acknowledge the futility of their efforts. In one story entitled “Spherical Trigonometry,” an eccentric tycoon funds the building of an unusually shaped shelter, in the hope that it will thwart the monsters. In another, “Sanctuary,” a Mexican-American family attempts to stay safe in a crumbling coastal town; here, the cosmic threat of the Great Old Ones boldly parallels the actual threats of discrimination and deportation for immigrant families. Indeed, each of these stories contains insightful commentary about our present-day society — a refreshing change of pace for cosmic horror, which can sometimes be a little too focused on the past (especially with Lovecraft’s pervasive legacy). As one of the most prolific contributors to contemporary cosmic horror, Barron has not only written tons of short stories in the subgenre, but some full-length novels as well — including this 2012 masterpiece, The Croning. It tells the story of Donald Miller and his wife Michelle, who’ve been married for nearly half a century and traveled all over the world, in Michelle’s relentless pursuit of odd anthropological findings. Don has always trailed her happily (from what he can remember, at least), but now — at the age of almost 80 — he’s starting to realize that something about Michelle isn’t quite right. This anthology brings more fresh perspective to cosmic horror with 19 thrilling short stories, all by female authors. These range from pieces written years ago and now finding a new audience, such as Joyce Carol Oates’ “Shadows of the Evening,” to works by up-and-coming authors like R.A. Kaelin (who authored the final story in the collection, “Mnemeros”). Like Dreams from the Witch House, Daughters of Cthulhu focuses on women in Lovecraft — though in this case, the women are the characters, rather than the writers. Among them are Lavinia Whateley — a minor character in Lovecraft’s The Dunwich Horror, who finally gets her own detailed (if disturbing) origin story in "Lavinia’s Wood" — and Shub-Niggurath, one of the few “female” Great Old Ones of Lovecraft’s work. Though certainly not intended to serve as role models — indeed, a few are literal monsters — these thoroughly three-dimensional (and extra-dimensional!) ladies are another much-needed addition to the cosmic horror canon. Cthulhu’s Daughters should entertain and satisfy any reader who’s ever craved more female backstory from Lovecraft’s works. Praised as one of the most nuanced Lovecraft retellings in the twenty-first century, The Ballad of Black Tom begins in 1924 Harlem with the eponymous hustler, Tommy Tester. Tom has always kept a low profile, even as a street musician… until the day he’s recruited by a reclusive millionaire, Robert Suydam, who wants Tom’s help to manipulate a creature of inconceivable darkness. With the introduction of jaded New York detective Malone, this tale twists into a true nightmare, as Malone recounts findings that signify a completely changed world. Not only is this novella compulsively readable, it’s also another significant contribution to the subgenre: as an African-American man himself, LaValle has noted that The Ballad of Black Tom is a conscious response to Lovecraft’s racism and xenophobia, particularly in his story “The Horror at Red Hook” (upon which LaValle’s work is based). And indeed, by mirroring these prejudices in his book’s setting (which again, is 1920s New York), LaValle has created a brilliantly commentative and deeply resonant modern work that any reader can enjoy. Similar to The Ballad of Black Tom, Lovecraft Country focuses on a young African-American man who must navigate the perils of both cosmic forces and basic civil rights (this one takes place in 1954, when Jim Crow segregation laws were still in effect). Atticus Turner, our hero, embarks on a journey to find his mysteriously missing father — employing the services of his uncle, who’s written a guide to “safe travel” for black people in the 1950s. Along the way, Atticus and his companions encounter many obstacles big and small; however, nothing can prepare them for what awaits when they discover his father, held in shocking restraints for a truly pernicious purpose. It’s a Get Out-level plot twist, racial implications and all. And if that comparison intrigues you, get excited for the upcoming Lovecraft Country series, to be produced by none other than Jordan Peele. Coming full circle from the fishermen in House on the Borderland, we now have the fishermen of The Fisherman: Abe and Dan, a couple of widowers who’ve bonded over their shared grief and coping mechanism of fishing. They’ve also both heard fantastical rumors of Dutchman’s Creek, where the fish are endless and easy to catch — the stuff of some kind of ancient Biblical miracle. Dutchman’s Creek, however, is certainly not the work of God; if anything, it’s the very opposite. Nevertheless, Abe and Dan can only hear so many rumors before they are compelled to try their hands (or rather, their rods) at the spot. Will they be dissuaded by a local who knows the true history of Dutchman’s Creek? This immersive novel will have you biting your nails right alongside the characters, and leave you more haunted than ever by the possibilities of the deep. Meddling Kids is a modern classic, as well as a great comic alternative to all the super-dark cosmicism on this list. It follows a Scooby-Doo-like gang of young crime-solvers — once a troupe of actual kid detectives, now in their twenties and living completely separate lives. All have been battling their own personal demons for years: Andrea “Andy” Rodriguez is wanted in multiple states, Kerri Hollis is an alcoholic, and Nate Rogers is locked in an asylum, supposedly communicating with ghosts. These one-time meddling kids know that the only way to save their present selves is to delve back into the past… so they reunite to get the bottom of a few old mysteries, once and for all. Nostalgic charm meets profound, visionary horror in this totally unique work, which will make you see Saturday morning cartoons and wholesome Hardy Boys plotlines in a whole new light. We’ll wrap things up with an exceptional piece of cosmic horror by another female author, Caitlín Kiernan (also a contributor to Dreams from the Witch House). In her novel Agents of Dreamland, a government agent called “the Signalman” attempts to gather information about an elusive cult, who call themselves the “Children of the Next Level.” The cult members consume strange fungi to psychically elevate themselves — but as the Signalman finds out too late, these are no mere magic mushrooms, but biology-warping weapons from another world. With plentiful body horror and a deeply disconcerting narrative style, this book is all the best (or worst, depending on how squeamish you are) parts of Aliyah Whiteley’s The Beauty and Vonnegut’s Slaughterhouse-Five — neatly paying tribute to classic science fiction in the same breath as Lovecraftian horror. Discover your next big horror read today! Get early access to the freshest indie books, each and every week.